Now, as I mentioned, this cake took me two days to make. This isn't something you can whip up real quick before a last minute dinner. Both the marshmallows and the frosting need several hours to set up, and they're even better left over night. Some things are worth waiting for, you know? All of these recipes are independently delicious, and would definitely work well in other combinations. I can't wait to use the rest of my marshmallow fluff! Maybe on a peanut butter sandwich...yum. The first thing I decided to make were the marshmallows, because those need the longest to set up. They are surprisingly easy to make, though! If you've ever made a meringue, you're basically halfway there. 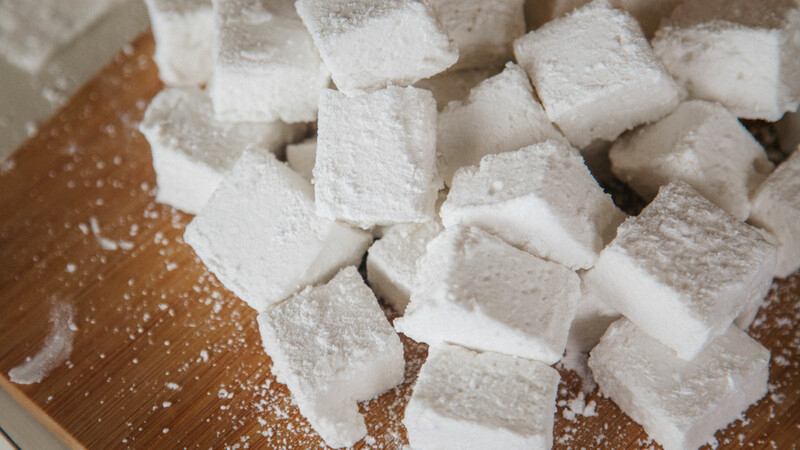 You could try swapping out the vanilla extract for real vanilla bean if you want a stronger vanilla taste, or even another flavor, such as peppermint or something citrusy; these marshmallows are a blank canvas for you to experiment and explore with! This recipe makes A LOT of marshmallows; I had a generous pile atop my cake, with more than half the batch left over. Luckily, if you keep them airtight, they'll last at room temperature for about a month or so. Bring on the hot cocoa!! Cut into giant squares to make super gooey s'mores! 2 teaspoons pure vanilla extract, or one vanilla bean, scraped. In the bowl of a very clean mixer, add the first half of the water. Sprinkle gelatin into the water, set aside to bloom. Prepare a 9x13 baking dish with wax paper or parchment, making sure to leave enough paper overhang so you can remove the marshmallows from the pan when ready to cut. In a small to medium saucepan, add your sugar, corn syrup, salt, and second half of the water. I know, you'll want to stir it all, but leave it unmixed! Mixing it can cause sugar crystals to attach to the pot and then your sugar wont cook properly. Attach a candy thermometer to your pot and cook on medium- high heat until the temperature reads 234F. Remove from heat. Pouring the sugar mixture into a glass measuring cup at this stage will help in pouring it into the gelatin. With your mixer's speed on low, begin breaking up the gelatin with your whisk attachment. Slowly begin to pour the sugar in a thin, steady stream down the side of the bowl into the gelatin. Once all the sugar has been added, add in your vanilla, then slowly increase the speed to high. Continue mixing on high until the mixture is thick, glossy, and white, and the mixing bowl has cooled until just barely warm to the touch. Sprinkle a generous layer of powdered sugar onto the paper lined baking dish. Carefully spread the marshmallow into the pan, evening out to a consistent layer. Sprinkle another generous amount of powdered sugar on top of the marshmallow, taking care to cover it all. Let sit at room temperature for several hours or overnight until solid. When ready to cut into squares, remove from the baking dish. Using a pizza cutter dipped in cold water, begin cutting strips of marshmallow, all the way through to the paper. Cut squares of desired size from your strips, making sure to dip your cutter in cold water in between each cut. Peel squares from paper and drop into a bowl of powdered sure, tossing and rolling to coat each side in powdered sugar until no longer sticky. Store extra marshmallows in an airtight container at room temperature for up to one month. After making the marshmallows, I decided to relive the process and make the fluff! I figured I would get both out of the way before moving on to messy chocolate things, but if you can't stand routine in your life, by all means, jump right to the frosting instead! Who am I to judge? The recipe for Marshmallow fluff was super simple and I actually found it over at Jaclyn's blog, Cooking Classy. You can get the recipe here. When searching for a fudgy chocolate frosting, I was really disappointed in my options. Most recipes I found were for American Buttercreams with cocoa powder added, which was just not going to cut it for me. I wanted something halfway between a rich ganache frosting and an airy whipped buttercream. Sift together the sugar, cocoa, and salt into a bowl, set aside. In a medium saucepan, combine the cream and butter over medium heat, stirring until butter has melted. Once butter has melted, add in the chocolate, whisking until smooth and no unmelted chocolate remains. Remove from heat. Add in the sifted ingredients, whisking until combined. Mixture will be thick and slightly grainy. Add the agave and vanilla, mixing until smooth and combined. Transfer frosting to the bowl of a stand mixture and refrigerate overnight. 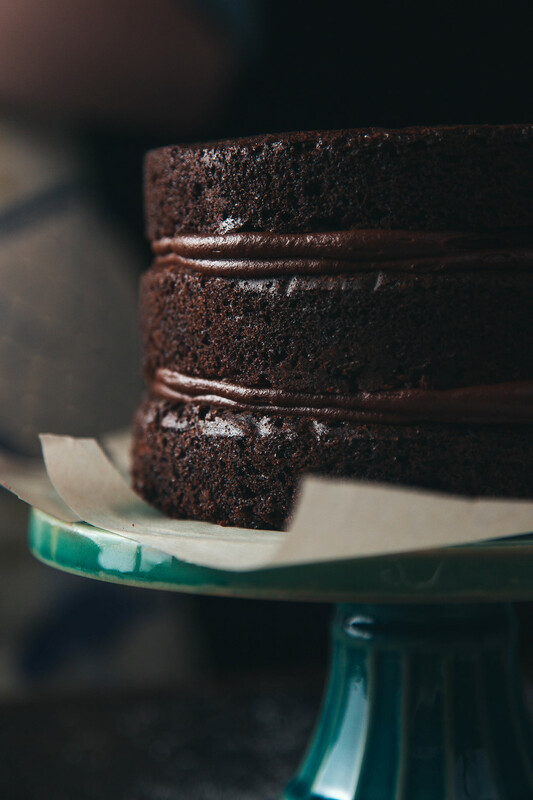 When getting ready to bake your cakes, remove frosting from the refrigerator to come up to room temperature. Using the paddle attachment of your mixer, break up the frosting a bit before transferring to a whisk attachment. Using the whisk, whip your frosting until it has become more airy and spreadable and slightly lighter in color. As the frosting sits, it will get darker again, but you can just rewhip it for a minute to get it back to your desired consistency. Last, but not least, we need a cake to put all of these goodies onto! 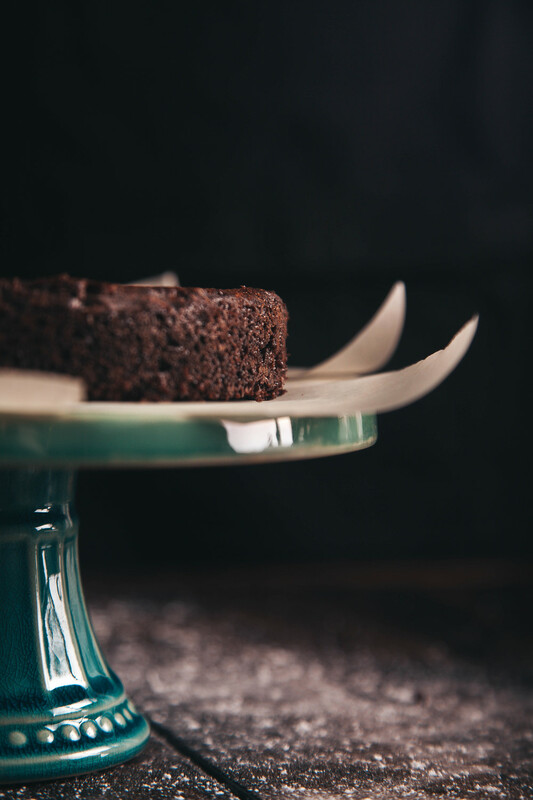 This recipe makes a cake that is somewhere between Devil's Food and Chocolate Brownie. It is a little on the dense side, but that makes it sturdy enough to stand up to the thick, fudgy frosting. Since it's only my boyfriend and I here, I decided to make a 6 inch cake. I didn't want too much to go to waste. With three layers of cake and rich fillings and frosting, though, this little cake can easily feed 8-10 people. If you're looking to feed a larger crowd, you can easily double the recipe to bake a triple layer 9 inch cake. Using a scooper to portion the cake batter into the pans ensures an even amount in each pan. reheat oven to 350F. Using butter on nonstick baking spray, grease the bottom of three 6 inch round cake pans, then add a piece of parchment into the bottom of the pan. This will help in removing your cakes from the pan and creating a smooth surface. In a large mixing bowl, whisk together the flour, sugar, cocoa, baking soda, and salt until thoroughly combined. Set aside. In a medium saucepan, combine the butter, oil, chocolate, and coffee, whisking until melted and combined. No pieces of butter or chocolate should remain. Remove from heat. Slowly whisk the chocolate mixture into your flour mixture until just combined. Batter will be very thick. Add your egg and yolk, then your milk and vanilla, mixing after each addition until smooth. Portion the batter evenly between your three prepared pans. Position your pans on the center racks of the oven, making sure to stagger the pans evenly. Bake 20 minutes, then rotate, then 5 minutes more. Cakes are baked when a toothpick inserted near the center comes out clean. Allow cakes to cool slightly on a wire cooling rack, still in the pan about 10 minutes. Remove cakes from the pans and continue to cool completely before frosting. We made it! We got through all those recipes! This cake is a lot of work but it truly is so worth it. That first bite after you've finished is so rewarding, you kinda forget everything you just went through. It's sort of like how women are naturally programmed to forget the agony of childbirth in order to keep wanting to grow their families. Certainly not to say having babies is a piece of cake...heehee I knew there was a cake pun in there to be made! Have any questions about cake decorating or the assembling process? Comment below and I'll glad answer anything I can! Have a particularly good pun to share? I'm all ears! Just want to say hello? I love love love hearing from you! I'm actually geeking out a little, because my humble little baking blog is starting to pick up some new readers from all you lovely folks who've been liking and sharing my posts! I even got my first comment last night, and I may have giggled like a schoolgirl when I saw it. None of this would be possible without all the love and support I've been receiving, especially from my boyfriend, who takes all my photos. You can check out his other work over at his photography blog. A photographer and a baker; what a match made in heaven! 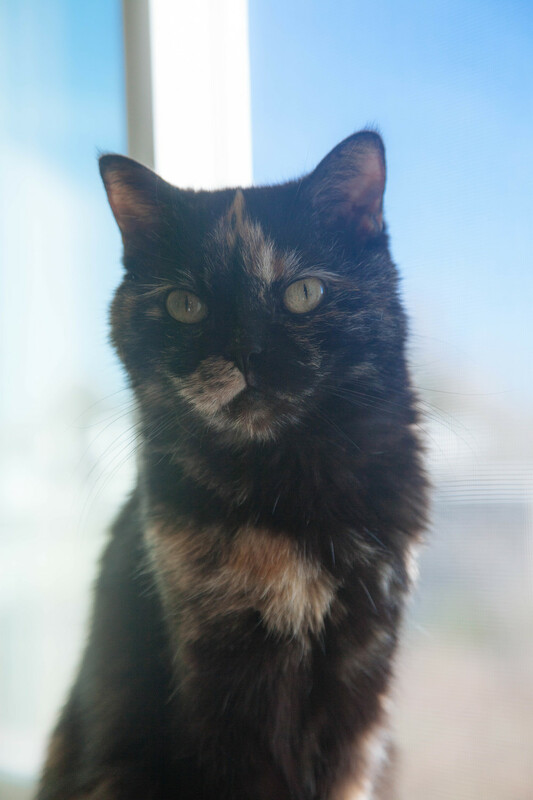 Now, if you'll excuse me, I've got some sun rays to catch with Bean.